Contributing editor at Fathom from its launch. Read four of my travel articles on Oman, India, Rome (text and photography) and London, here or below. You can walk the walk and talk the talk. But can you motor the motorino? Claire Oldman plays Italian for a day. ROME – In the early days of summer, the air in Rome is filled with the heady scent of something as sweet as honey. It's rincospermum, a plant in the jasmine family that blooms all over Rome. You catch a whiff of it as you open a window or when you walk through a patch of golden light between those ancient buildings. I tell you this so that you don't think, as I did, that you're having some kind of olfactory hallucination because you are overwhelmed by the city's beauty. If you only have a long weekend in Rome, whether you've been there before or not, you can feel pressured to do and see all the amazing things you're supposed to do and see in Rome. This very well may lead to lots of map-folding and queuing and overdosing on architectural awe. But you probably will not take the time to stop and smell the rincospermum. I believe that the best way to experience Rome is as the Romans do: with not too much hurry or stress and plenty of coffee and gelato. Hands down, the best way to get around in Rome is on two motorized wheels. You can see the whole of Rome in a day without getting too tired with freedom to stop whenever you like (parking is free and easy to find). I was lucky enough to have friends with friends with at least three Vespas of varied engine capacities at their disposal. But in the unlikely event that you don't, I wouldn't encourage anyone to just go and hire a scooter without first going to a major intersection to watch what Roman traffic is really like (utter chaos). If you're still feeling suicidal — I mean confident! — you can easily rent a scooter (up to 125cc) as long as you have a full valid driver's license. Barberini offers a scooter tour for up to five scooters (ten people) with a guide who will take you around for a few hours or the whole day to see all the major sites and more (€150- €300). Scooteroma also does tours and gives you the option of being driven as a pillion passenger (my preferred way to motor around). There's also a vintage Vespa tour if you want to live out your Roman Holiday fantasy. Gelato is eaten after lunch and dinner, but also before lunch and dinner, or before and after coffee. Basically, anytime you please. I found my favorite flavors at Gelateria del Teatro (Via di San Simone 70; +39-6-4547-4880), nestled in an alley off a charming, quiet street right in centro storico (historic center). The shop specializes in imaginative flavors, and I partook in a post-aperitif, pre-dinner raspberry-sage gelato and a scoop of honey-lemon-rosemary. Quite the palate cleanser. Further down the street is Casa & Bottega (Via dei Coronari 183; +39-6-68-804-037), a stylish little place for an aperitif, by which I mean savory hors d'oeuvres that arrive with drinks. It's also open as a café early in the day, which is good to know if you find yourself in the centro storico mid-afternoon having only had a gelato for lunch. The best coffee in Rome is at Sant'Eustachio Il Caffe (Piazza Sant'Eustachio 82; +39-66-8802048), where baristas whip the first drops of espresso with sugar to produce froth for a superior crema. Founded in 1938, it's popular with locals and politicians from the nearby senato della repubblica (Italian senate). On a Saturday afternoon, the bright yellow interior was packed so solidly with customers that we had to retreat to an outside table. Bonus view: Sant'Eustachio Basilica's stag statue. Porta Portese flea market is just like every other big city flea market, and yet you'd be hard pressed to find these goods anywhere else. Open from 6:30 a.m.-2 p.m. every Sunday in Trastevere, it sprawls (seemingly) forever and ever. (It's also the most popular location for pickpockets in Rome, so do watch out.) Feast your eyes on all manner of total junk and occasional treasures: modern kitchen implements, beautiful crystal chandeliers, old cameras, dusty kilims, reproduction rococo ornaments, fake perfumes, a box of toy horses, etc. Bonus view: A drunken hobo doing a wobbly dance performance in front of some other drunken hobos and a small crowd of curious onlookers. I had the restriction of hand baggage, but I bought a '60 glass-and-chrome apple container for €5. If I lived in Rome, I would furnish my entire apartment with judiciously chosen bargains. When you've had enough of the flea market, cross over viale Trastevere and wander the beautiful winding streets of the Trastevere neighborhood, the most picturesque little area. Which means, unfortunately, that it is overrun with touristy restaurants. (You won't know until you've been handed a laminated menu translated into six languages.) It's hard to find a place locals will happily dine, but Osteria der Belli (Piazza di Sant'Apollonia 11; +39-6-580-3782), next to Teatro Belli is where my actress friend told me her crowd regularly goes for post-show meals. 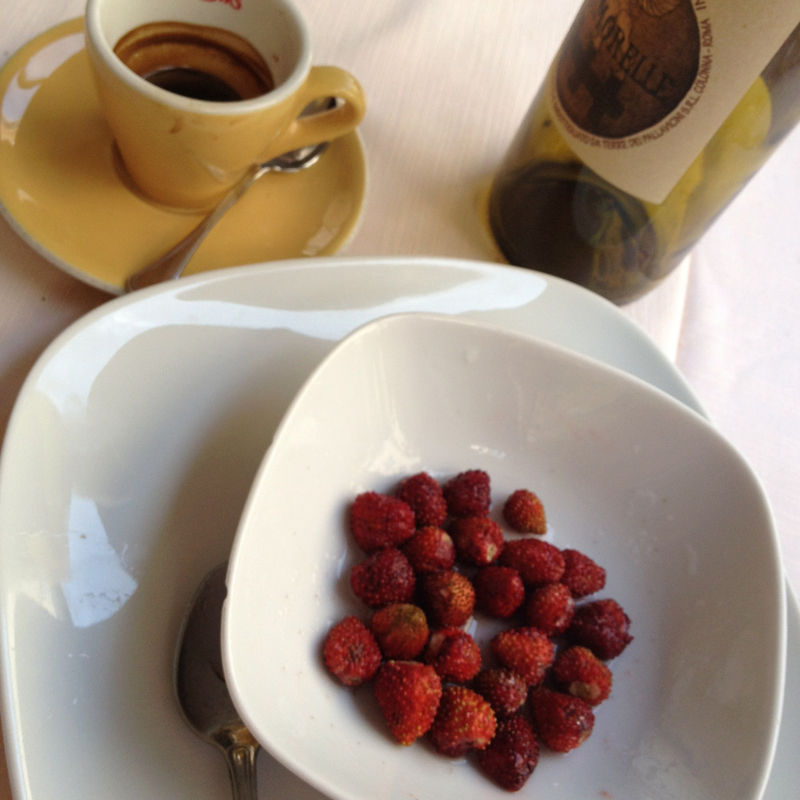 It's owned by four Sardinian brothers who served us a lovely meal and dessert of tiny wild strawberries with lemon and sugar, which we washed down with coffee. Cul-de-Sac (Piazza Pasquino 73; +39-6-6880-1094) is a wine bar with over 1,500 selections. A menu of small dishes revived our weary group. The cheese and charcuterie plates looked amazing, but I could not resist a small bowl of homemade pasta with pesto. The more typically Roman pasta all'amatriciana looked delicious, too. We were seated outside facing the peaceful piazza just 30 seconds away from the hordes at Piazza Navona. With few other customers there during the quiet part of the afternoon, we were able to chat with the staff and choose a refreshing white wine at our leisure. It was my last meal in Rome and it couldn't have been more perfect: sipping wine in the shade, away from the madding crowds. Then it was back on the motorino, cutting through the scented air, begrudgingly changing from a swishy cotton skirt into trousers, a wool sweater, and boots for the UK rain. There's no end to the different lives you can live in London — from grit to glamour to grime to royalty and back again in a few tube stops. I like to give the culturally inclined a good variety of grounding London experiences, especially if it's their first time. For the East End experience — and a cleaner, more relaxed alternative to Brick Lane and the rest of Shoreditch and/or Dalston — walk along Redchurch Street. At first, you might think there's not much going on, because it hides a wealth of places you want to go, all conveniently located almost next to each other. Stop at Labour & Wait (#85) for timeless, traditionally made products sourced from around the world and Hostem (#41) for men's avant-garde and street styles. Closer to Shoreditch High Street you'll find a tiny A.P.C. (#5), an equally tiny Aesop apothecary-style shop selling the Australian brand's beauty products (#5A), and a Sunspel T-shirt shop (#7). Everything nestles around the hub of Terence Conran's Boundary hotel and restaurant complex (2-4 Boundary St.; entrance on Redchurch St.). There's a rooftop restaurant and the bakery/shop and Albion café on the ground floor, specializing in casual British comfort food. Depending on the time and day, it can be relaxed (weekdays), touristy (evenings), or very posey (weekend brunch). If self-conscious posing isn't your thing, head around the corner to Leila's (15 Calvert Avenue) for a more low-key experience and simple, honest, delicious food. There are other great, grand museums in London that you can easily spend all day in, but the Victoria and Albert Museum is always interesting, is never stuffy, and has expertly curated with world-class art, design, textiles, and fashion exhibitions. It's impossible to get bored. Add to this a fantastic range of events, late Friday hours (until 10 p.m.), a brilliantly stocked shop, cafés, and a garden, and you actually can make a day of it without getting museum fatigue. At the V&A Reading Rooms on Exhibition Road, you can browse books and have a glass of wine. A Little Bun Moment is one of those ceremonies that are pleasurable on lots of levels. I think of it as the modern version of afternoon tea, and there's no other way I'd rather spend a London afternoon. Cosseted away from the din of Chinatown and Leicester Square in the ultra-minimal surroundings of the bar at the St. John Hotel, between the hours of 3 and 5:30 in the afternoon, you will be served three steamed buns on a tiered silver tray and instructed on the order in which to eat them (top to bottom). The top bun is filled with anchovy paste, the middle with prune, and the bottom with chocolate. They prefer that you drink Champagne with buns but will allow you to order tea. No other department store comes close to the character and charm of Liberty, so make this your only stop, even if you don't buy anything. The iconic Tudor revival building, constructed from reclaimed ship timbers, melds history, tradition, craft, and the brand new without batting an eyelid. You can find everything here, from the extremely affordable (stationery, chocolates, Liberty-print handkerchiefs) to the less so (the contemporary designer, shoe, accessory, and furniture departments showcase the best in design). Not to be missed is the fabric and haberdashery section, housing all the world-famous Liberty print fabrics in one place. The 1950s modernist Southbank Centre sits by the River Thames and offers a vast array of cultural activities, from music to theater, art, and film, as well as lots of bars and restaurants. Frequented by Londoners and visitors alike, it's a great place to spend a Friday night. The British Film Institute has an outstanding program of classic and contemporary films, a restaurant, a dark cozy bar, and a riverfront bar with an outdoor terrace and deck chairs. Royal Festival Hall and Queen Elizabeth Hall often have free music events in their foyers, alongside the ticketed programs of theater and music. RAJASTHAN, India – Of all the places I visited in India, the village of Deogarh in Rajasthan was the most sedate. Deogarh felt like the place with the least potential for imminent catastrophe, which was the overriding feeling from the moment I touched down at Delhi airport until the time I took off from Mumbai — watching children play cricket on a garbage heap in a slum next to the runway. The feeling of constant unease is hard to explain, but the bombardment of intense visual images put me on high alert. But far out in the desert of Rajasthan, I found serenity at the Deogarh Mahal, a four-hundred year-old hilltop fortress (then) and luxury heritage hotel (now) that rises out of the desert like a dream castle. In Deogarh there's dirt on the ground, but the dirt seems cleaner than in other places. I suppose what I'm saying is the village of Deogarh is lovely, and that it also has a slight feeling of having been sanitized for the hotel guests. Finally, I let my guard down. I felt pretty relaxed as we toured the village followed by hoards of adorable kids who wanted us to take their pictures with our huge cameras. We had a few errands to do: some clothing alterations in advance of the wedding we came there for, which would be held late that evening due to the day time temperatures reaching 47 degrees Celsius. A determined little girl led us to her father's fabric shop, then to her uncle's jewelry shop where I bought a handmade silver bracelet (the price of which was determined by weighing it on a rusty old set of scales). We wandered towards the gate in the thick ancient wall of the village, just to see what lay outside its boundaries. There were a few motorbikes and some of the sharp-horned cows particular to this part of India milling about, as cows are prone to do. As we passed through the arch in single file, a cow that was calmly grazing a few feet away suddenly charged at me full-on and head-butted me in the ribs. I flew backwards but managed to stay upright. I felt the cow's smooth sharp horns on either side of my torso. I remembered hearing that when people are stabbed they sometimes don't feel anything at first. I gasped, stunned, and held my side — and then I realized that the entire village was staring at me with mouths open. Everything I'd been told about sacred cows flooded into my head: They represent "Mother." They are revered in Hindu culture. Until the 1960s the sentence for killing a cow was death. The cows you see roaming about the cities and towns of India may belong to no one, yet they are always fed and cared for (even when humans are not). Still. The entire village stared back. Winded and freaked-out, I let my hands fall from my ribs to show there was no wound. I tried to act casual as I strolled along with my friends (who tried to do the same). How did I provoke its ire? What did this mean to the villagers? Was I cursed in their eyes, or was it perhaps considered lucky, like when a bird craps on your head? I had to walk back through the arch past the cow, and I avoided making eye contact with it. It was loitering menacingly, gloating in the aftermath of its successful attack. On second thought, maybe it was just grazing. Back at the Deogarh Mahal, I felt shy divulging my cow-butting incident to my Indian hosts. I feared they would think my cow paranoia silly and childish, even if they were too kind to say so. I continued to worry that I was a marked woman in the bovine world, but eventually I confided in someone sensible who shrugged and said, "It probably just wanted you to give it some food." A practical answer, sure, but I still think that cow was out to get me. 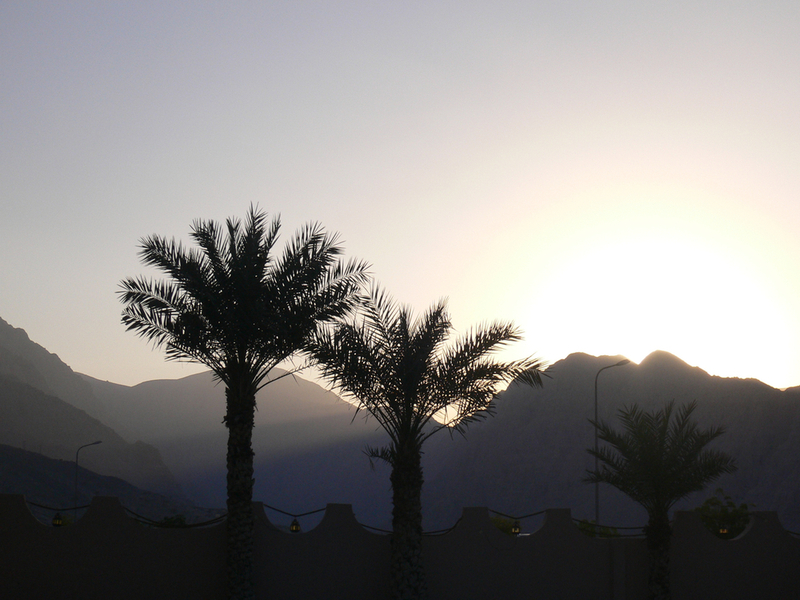 OMAN – The road from Dubai to Oman passes through four other Emirates. There are no maps. There are only a few signposts along the way and we've been given scribbled directions that say things like: Continue forward 100 km and turn left at the tree. We begin on the wide highways beyond Dubai, leaving the glass and concrete towers of commerce behind. We pass through Sharjah, where the pre-mixed gin and tonics concealed in water bottles in the boot of our car (yes, we're English) become a vague source of concern when someone points out that people are stoned to death for minor infractions in this dry state. Some Emirates we pass through are completely unmemorable, except for obvious signs of a lack of prosperity compared to oil-rich neighbors. The last Emirate before the Omani border is Ras Al Khaimah, which is dominated by a large cement plant and a ceramics factory. The only sign of life is a skinny goat trying to find shade under a leafless tree. Lou, a lifelong family friend, lives in Dubai. Her parents and I are visiting for Christmas. There are two checkpoints at the Omani border, and the fees vary from person to person. It's a bit of a long-winded kerfuffle that leaves us feeling jaded. 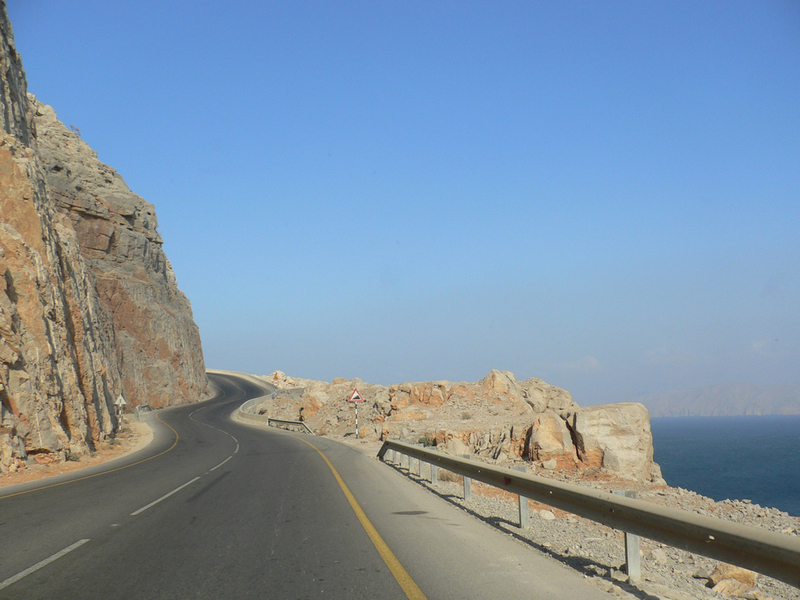 But the gloomy drive suddenly turns out onto a coastal road that winds around the Musandam Peninsula. The change is instant and breathtaking. The sudden landscape of mountainous rock plunging dramatically down into the sea looks like the result of a volcanic eruption. Because of these fjords, the Musandam Peninsula is known as the Norway of Arabia. There are barely any buildings — just the mountains, the sea, and a gleaming tarmac road that winds along and up, slicing cleanly through the rock on both sides. It's a marvel of engineering, even to someone who has absolutely no interest in engineering. The Musandam Peninsula, which is separated from the rest of Oman by the United Arab Emirates, is still relatively unvisited, except by divers looking to explore the pristine coral reefs. The new road has made it possible to go where few have ever been. Still, we don't see any cars in front or behind us, even in Khasab, the capital city. There is a fledgling tourism movement — most people end up at the Golden Tulip Hotel, one of three hotels in Khasab. There's also a petrol station, an airstrip (no international flights yet) a couple of restaurants, and a population of 18,000, though we count only four people. Besides driving, the other mode of transport is via dhow: a traditional wooden Arab sailing boat. These have been used for everything from pearl fishing to cargo, but now often carry people. A dhow cruise isn't anywhere near as touristy as it sounds, and I am thankful we are the only Westerners on our boat. We pass fjords and inlets while lying back on low patterned tapestry cushions, drinking hot sweet tea, and eating fruit and dates. Dolphins swim and play alongside us. From the water we can see remote coastal villages only accessible by boat. At Telegraph Island we strip down to our swimsuits and jump into the water. The rest of the women in our group politely queue for the boat's loo, so that they can change into modest head-to-toe bathing suits in a space the size of a picnic hamper. They all make it into the water eventually. We decide not to stay at the Golden Tulip, which is a bit dilapidated and lackluster — possibly due to the lack of competition — but still expensive (£14 for a gin and tonic at the bar). Instead, we take our smuggled booze to an apartment to drink in private. (Alcohol isn't banned in Oman, but driving with alcohol on board without a permit is not allowed in the UAE.) On a friend's recommendation we stay at Esra Hotel Apartments in Khasab, which is basic, but clean enough. (Khasab Travel and Tours also arranges dhow cruises.) Our apartment is rented to us by an Omani woman who is so elegant in her black abaya that we feel like apologizing to her every time we tromp past her in our Western swimsuits to get to the pool. We get a few funny looks from the neighbors — but these are of bemused interest, not hostility. The Omani people we meet are incredibly kind and hospitable, and they are keen to tell us about all the improvements being made to the infrastructure by the sultan: roads first, then hospitals, then schools. At dusk we watch the mountains turn shades of lilac I've never thought possible, and it feels that we are at the edge of the world. All site content copyright ©Claire Oldman 2018. All Rights Reserved. Text and images may not be reproduced without permission.